This past week, I was the guest of Weatherby, who know how to throw a party. This year, Weatherby has opted out of its long-standing arrangement with SKB, who made their shotguns, and gone with an Italian gunmaker named Fausti. The result is an entire new line of nifty new o/u and side-by-side shotguns that range in price from modest to pretty damned expensive. They're callled the Four-Lock series, because the actions lock up at four points, and they are altogether nifty guns. I quail hunted with an o/u and a side-by-side on two successive days, and if I can hit a quail with anything less than a 10-gauge, it must be a pretty damn good gun. However, the shotgun is a silly and unimportant machine; it's rifles that count, and there are two neat new Vanguards. Exclusive: Fred Thompson on the U.N.
Last year, the United Nations Sub-Commission on the Promotion and Protection of Human Rights declared that international human rights law requires all nations to adopt strict gun control laws. These “minimum” provisions are much more restrictive than any of those on the books anywhere in the U.S. and would almost certainly violate the Second Amendment of our Constitution. There is another disturbing aspect to this call for international global gun control. Throughout modern history, the forced disarmament of people by its government has often been accompanied or followed by that government’s commission of often massive human rights abuses. In fact, no genocide in the 20th century occurred when the victim population still possessed small arms, legally or illegally, with which to defend themselves. So now the UN wants to disarm civilians? Where was the UN when the massacres in Rwanda occurred? What did the UN do to protect the victims of ethnic massacres in Bosnia? Disarming civilians under the guise of international human rights law will only lead to more such genocides by ensuring that civilians can never defend themselves! It would be funny if it weren’t so perverse. Thankfully, the Framers of our Constitution recognized this potential peril to our liberty, and enshrined in our Second Amendment the more basic right of self-defense. The U.N. can say what it likes about other countries’ citizens’ possession of small arms being a violation of human rights law, but so long as the United States is a sovereign nation governed by its Constitution, its words will have no effect here. And I am glad for it. My own feeling is that the U.N. would screw up the recipe for ice water. The U.N. could not break up a fight between a couple of girl scouts. The U.N. building would make an excellent high-rise apartment site. But I’m not running for president, Mr. Thompson is. Your thoughts, please. A Note from the Editors: In Dave’s most recent posts, a few of you have been asking for information about two new rifles, the Browning X-Bolt, and Winchester’s latest Model 70. 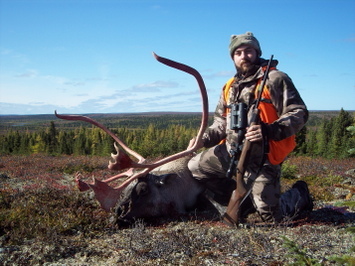 Dave is out of the office right now, but Deputy Editor Anthony Licata had the chance to go hunting with prototypes of both guns a few weeks ago (he shot two caribou with them). We thought you might like to read his impressions of the rifles. Well after much chatter and rumor, the real story is out. Winchester has resurrected the legendary Model 70, and Browning has surprised the shooting world with a brand new bolt-action rifle called the X-Bolt. Browning X-Bolt. The first thing you notice when you shoulder the X-bolt is how sleek it feels. It’s a handy little number and weighs 7 pounds in long-action, wood-stocked versions, 6.5 in the short-action composite. It comes to the shoulder like a fine shotgun and was easy to carry around the tundra all day. But pulling the trigger was what really made me smile. It’s superb. There’s been a trigger renaissance among factory rifles, and Browning calls their version the “Feather Trigger.” Sounds about right to me. I felt like I only had to think about it, and it fired. It’s adjustable with a turn of a screw from 3 to 5 pounds, and broke crisply. Other nifty extras on this gun include: a bolt-unlock button that allows you to open the bolt with the tang safety still engaged; a completely new scope mounting system that uses four screws per base, and a detachable rotary magazine that feeds cartridges in line with the bolt. The barrel is free floated, and the bolt has three locking lugs and a 60-degree lift. The X-bolt has a classic American style stock, but with some subtle lines that give it a modern look. Note that the checkering above the trigger guard on the early prototype shown in these photos has been eliminated in the final version. Price will be $800 to $1050 and comes in calibers from .243 Win to .375 H&H. Here is a nice story. Glenrock Blue is a tiny gunshop cleverly hidden on a back street in the miniscule town of Glenrock, Wyoming. It's run by the husband-and-wife team of Phil and Di Filing. Phil handles the metalwork and Di does the stocks, and together they bring guns back from the dead. You bring in some old beater that looks like it fought and lost at Little Big Horn and they will have it looking better than it did when it left the factory. Anyway, I was there a few weeks ago and Phil handed me a Model 54 Winchester bolt-action .30/06. The serial number was 90-something, which meant it had been made in the late 1920s. It was in fine shape, except for some rust at the muzzle and on the front sight ramp, and it still had an ancient 2.5X Weaver scope mounted right down on the receiver, ahead of the bolt. The owner wanted the rust polished out and the barrel reblued, which would just about ruin the gun for a collector (As it was, it would bring $1,500 or so from someone who wanted it bad enough. ), and Phil told him so. "I know," said the owner, "but my father gave it to me 50 years ago, and it was in perfect shape, and I want to give it to my son in the same condition." Now there, I think, is a man with his values as they should be. If you're interested Glenrock Blue, the phone is 307-436-2330; gunbluing.com. Be advised, however, that they don't turn guns around overnight. They are famous among shooters of taste and culture, and they have a lot of guns to work on. 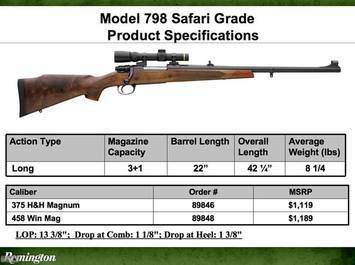 Lurking, almost unsung in the Remington 08 lineup, is an absolutely terrific rifle called the Model 798 Safari Grade. It is a true, long-action, all-steel Model 98 Mauser stocked in laminated wood that looks like high-grade walnut. The barrel is 22 inches long, which is the proper length for a dangerous game rifle, and the front sling swivel stud is out on the barrel where it won't gouge your hand. The price is $1,119 for a .375 H&H, and $1,189 for a .458. To put this in perspective, it's quite possible to pay that much for a Mauser action in the white. My colleague Wayne van Zwoll, a person of the highest literary and moral worth, thinks this gun is the biggest bargain in the Remington line, and I concur. Is is perfect? No. The trigger needs work, and the rear sight is silly and useless because it's adjustable, and because it folds down. When something comes for you, and you go to use this hideous sight, the odds are it will be folded flat against the barrel, and you will be folded flat against the ground as a result. No, throw the thing away, and have the gunsmith make you a non-adjustable rear sight, filed to hit dead on at 50 yards, that will not fold, sit up, bark, roll over, or bring you the morning paper. But enough of this. Don't let these minor flaws blind you to an incredibly good rifle at what is truly a bargain price. At the recent Remington Seminar where they introduced the R-15 black rifle (that is really a camo rifle), a number of the older gun editors were seen to mutter in their false teeth about the radical turn that an old, traditional company like Remington was taking, and how they disapproved. "Look, you've got thousands and thousands of young guys out there who love these things, and if it keeps them shooting, I'm all for it. A lot of them learned to shoot from a drill sergeant; their fathers didn't teach them. They were busy playing golf or jogging. This is what they know and what they like." I don't remember who said it, but give the man a medal. We've been Bolt-Action Nation for so long that we forget we were once Lever-Action Nation, and that what converted us was millions of young men being introduced to the 1903 Springfield, courtesy of the U.S. Army and the United States Marines. As long as it goes bang, let us think kind thoughts about it. And what, pray tell, is an R-15? Why bless your universally legal 5-round magazine, it's a black rifle made by Remington, except that it's not finished in black, but finished Advantage Max-1 HD camo. This all came about because a few months back, Remington was purchased by Cerberus, a management company that also owns Bushmaster, which is a leading producer of black rifles that are black. Back in the early 1980s, I was invited to join a group of men who went out to dinner every Thursday evening. They were all customers at a small-town gunshop who had gotten friendly with the owner. An extremely unlike group of people, they included myself, two gunsmiths, a retired New York State trooper who was now a locksmith, a high-school English teacher who had a degree in comparative literature from Harvard, a Wall Street plutocrat, and a machinist. We would go to a local restaurant, ogle the waitresses, argue, insult each other, and talk about guns and hunting and the military. The intellectual progress of mankind did not advance one iota, but we enjoyed ourselves and each other. Of course it did not last. One of the gunsmiths moved away; the Wall street plutocrat retired and moved as well; the machinist and the English teacher died, and finally the gunshop itself closed. We were all very lucky to have had what we did, and we knew it even at the time. And I can't think of anything save an interest in guns that can bring together so disparate a group of people, again and again, in place after place. The Worst Gear of All Time? Last week, you may recall, we played a most excellent game whereby we nominated one or two items of the best hunting gear we've ever used. Now, we're going to do the reverse--the worst. As they say in Texas, "I'll take two o'them--one to s**t on an' t'other to cover it up with." My first nomination: any poly underwear that is labeled "odorproof." Whose odor? Natalie Portman's? I am sure that if Natalie wore the stuff for a week in elk camp it would not smell too bad. However, when I wear it, dogs run off howling. My second nomination: The last Winchester Model 70s produced in New Haven, CT. Guns built by people who had given up. It wouldn't have been so bad if they were another make or model, but these were Winchester Model 70s, and that name used to mean something. Periodically, I get a letter that reads: "Dear Dave: I am going antelope hunting for the first time and need a rifle that can take them at 1,322.5 yards. What cartridge do you recommend?" doe at 130. A friend who was with me also tallied two animals at about the same ranges using a woefully lacking .308 and 150-grain Winchester factory ammo. That is more or less typical antelope hunting. If there is something the matter with you and you want to blaze away from an adjoining county, you are welcome to, but the fact is that the antelope is not the brightest creature God put on earth, and they can almost always be stalked to within a couple of hundred yards and, in many cases, a lot less. What our ballistically underprivileged rifles did not do was tear huge hunks of meat and bone out of the goats or pulverize them into soup. I've had this experience with high-velocity cartridges, and that is why I use the Swede. Even if you do get a 300-yarder, the little round will hack it. That Swift bullet is very long and very streamlined, and while it doesn't start out with gobs of fps, it holds on to the ones it has very nicely.